The history of the Ballester-Molina dates back to 1929 when two enterprising Spaniards, Arturo Ballester and Eugenio Molina established a company for producing Hispano-Suiza automotive products in Buenos Aires. The name of this company was Hispano Argentina Fabrica de Automoviles Sociedad Anonima (HAFDASA), or Spanish-Argentine Automobile Factory, Incorporated. Several years later, HAFDASA hired a pair of engineers, the frenchman Rorice Rigaud, and Carlos Ballester Molina (a member of both the Ballester and Molina families). Rigaud eventually became HAFDASA’s chief design engineer, while Ballester Molina, originally responsible for metallurgy, heat treatment, and production methodologies, became HAFDASA’s Chief Executive Officer (CEO). HAFDASA won a contract with the Direccion General del Material del Ejercito (DGME), or General Directorate for Army Materiel, to supply the Argentine military with trucks, buses, and engines. The DGME later commissioned HAFDASA to investigate the potential manufacture of small arms. In 1936, in response to the DGME request, HAFDASA began to design and manufacture small arms. There was nothing revolutionary about HAFDASA’s work. The factory established a pattern of adapting existing designs to satisfy the requirements of the Argentine military and police forces using indigenous materials within HAFDASA’s production capabilities. To this end, in 1936, HAFDASA unveiled a semiautomatic carbine based on the Beretta M1918/30 in calibers 9x19mm and .45 ACP. Following the introduction of the two carbines, the DGME requested HAFDASA to produce a pistol chambered for the .45 ACP cartridge to serve as an (indigenously produced) replacement for the .45 ACP pistols then in service with the Argentine military and police forces. The contract required HAFDASA to produce a pistol along the general lines of the Modelo 1916 and 1927 Colt pistols then in service and to have barrels and magazines that were interchangeable with those pistols. The HAFDASA engineers began work on this contract in late 1936/early 1937. The decision was taken modify the original Browning design to facilitate and economize production along the same lines as two Spanish companies Bonifacio Echeverria, S.A. (Star) and Gabilondo y Cia, S.A (Llama). The main changes introduced by these companies were the elimination of the grip safety, a backstrap integral to the frame, and a pivoting trigger with a side mounted sear bar and disconnector. These changes, as applied to the Star Model B pistol were of particular influence to HAFDASA’s designers. a) The hammer strut on the HAFDASA pistol is much shorter than that of the M1911A1. b) The firing pin stop on the HAFDASA pistol is not recessed on the side as it is on the M1911A1. c) The safety lock on the HAFDASA pistol is redesigned with a larger diameter pin, and it can be applied with the hammer cocked or fully down. d) The mainspring housing on the HAFDASA pistol is an integeral part of the frame. e) The HAFDASA pistol has a pivoting trigger with a single extension along the right side that cams the side mounted disconnector and engages the sear. f) The magazine catch on the HAFDASA pistol is assembled differently. g) The HAFDASA pistol has no slide stop disassembly notch. At some point between 1940 and 1942, HAFDASA changed the trademark name of the pistol from “Ballester-Rigaud” to “Ballester-Molina,” with the change reflected in the markings on the slide of the pistol. At the same time HAFDASA began to use plastic, instead of wooden, grips on the pistol. It was also around this time that HAFDASA received an order from the British government for between 8,000 and 10,000 .45 caliber pistols. Payment for these pistols was made, in part, with steel supplied by the British government. Due to the scarcity of raw materials in Argentina due to the Second World War, it is highly likely that the steel was of U.S. origin supplied to England via Lend-Lease, and consequently not prior to March 11, 1941. According to Alejandro Gherovici, noted expert on Argentine service pistols, no steel salvaged from the pocket battleship Graf Spee or any other warships was used to produce the British contract or any other HAFDASA pistols. Production of the British Contract pistols started in 1942 and continued until mid-1944. British Contract pistols are easy to identify as they bear a serial number prefixed by a “B,” between the 12000 and 21000 serial number range. 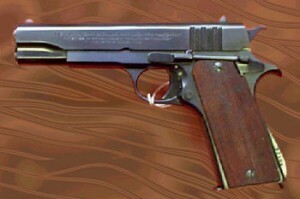 After the end of the of the British Contract, HAFDASA continued to produce pistols for Argentine government and commercial usage until 1953. Starting in 1947, the HAFDASA pistols had been supplanted in Argentine use by the DGFM Sistema Colt M1927 pistol, a clone of the M1911A1. While the HAFDASA pistols began to be withdrawn from Argentine service in the 1960’s, many served until the mid-1980’s when they were finally replaced and sold as surplus on the US market. It is believed that HAFDASA produced between 80,000 and 90,000 .45 caliber pistols. HAFDASA exported pistols to Bolivia, Colombia, Ecuador, Peru, Uruguay, and Venezuela.